OSWEGO, NY – Morningstar Residential Care Center recently welcomed the American Red Cross Bloodmobile. 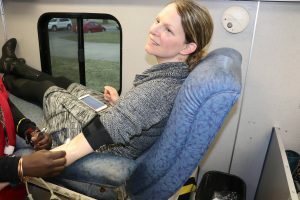 Donating blood is Morningstar Registered Dietician Elaine Everitt. Morningstar hosted a blood drive that allowed employees to conveniently donate blood to the Red Cross.